So, last Fall was tough. After a full year of coaching and competing myself, I ended up coaching my sons’ cross country team while simultaneously training a few lifters and throwers in the early mornings in addition to all the other teaching, parenting, etc. I do. So, when all that was done and all the meets were over, I was feeling pretty beat up. I hadn’t recovered from the damage I’d done to myself running the half marathon, and I just didn’t have much motivation to do much more than lift and throw with no big goals in mind. Both of which are really hard on the body. Although I intended on spending the Fall losing some weight and getting back into training, I quickly learned that I was way more damaged than I thought and ended up spending a lot of time with my chiropractor and simply resting my body and mind. By December, however, with the lack of activity, the nagging pains in my knees and shoulders were screaming for attention and I wasn’t really sure what to do next. I think this is a situation we all find ourselves in from time to time. Stress and fatigue stops us in our tracks and we think we can recover by laying low and taking it easy. At my age, however, (45) inactivity quickly escalates into disability. Doing things my way simply wasn’t working and when you are your own coach, its very easy to slip into giving yourself bad advice or talking yourself out of doing the things you know you need to do. I knew what I needed to do: Lose weight and rehab my joints with some higher volume/lower intensity training. But, I didn’t know where to start. Another downside of being your own coach is that you don’t have the objectivity to coach yourself and when you are exhausted and not motivated, its even worse. So, I decided to set a new goal that was compatible with both cutting fat and rehabbing my joints. And guess what that is? Yep, bodybuilding. I hired a figure coach with the idea of competing in a year or two. I did this because ultimately, accountability is one of the most powerful tools in training. Although I know how to bulk and cut athletes for competition, good bodybuilding/figure coaches know a lot more about how to not only do this well, but safely over the long term. 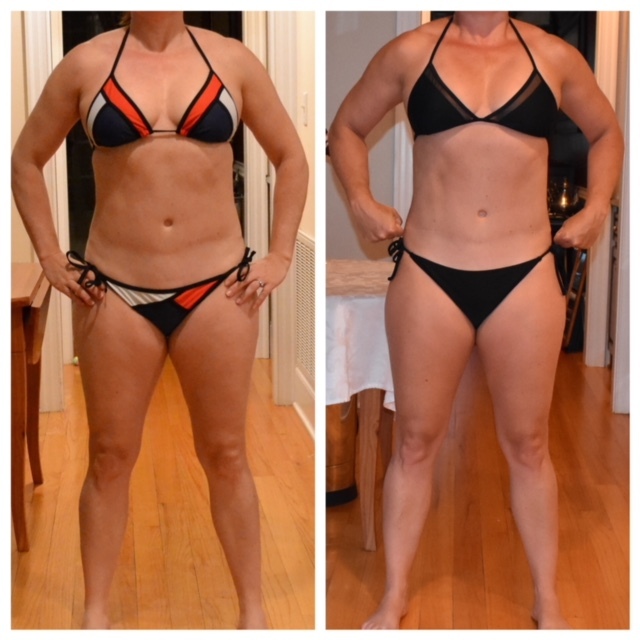 I have been working with Laura Cary of Nuflexion Fitness for almost six months now (Google her, she’s on FB and Instagram) and its been great. Actually, not just great, I’m really impressed with her and that doesn’t happen easily. I hired her because honestly, at first I just liked the way she looked. To me she looked like an athlete, like someone who was fit but also physically capable and strong. I was even more pleased when she started training me. Her diet approach is gradual and about adjusting your metabolism and not just starving you down. She also takes the long term approach to building muscle so when you finally do cut, you don’t look like a gristly skeleton (which I’ve seen happen a lot). Finally, although I haven’t worked out in a commercial gym in over 8 years, I found that a lot of the machine exercises she prescribed were exactly what I needed to rehab my shoulder and knees. After two months, my shoulders were as good as new. The knees are taking more time (because I abused the crap out of them), but the good days far outnumber the bad now. About 5 months of training, same weight, 3 inch smaller waist, a heck of a lot stronger. I’m about to compete at Grandfather Mountain next weekend in the first highland games for me this year and my throws are far beyond what I have managed since I trained for masters worlds two years ago. I credit a lot of this not only to the rehab and reduction in pain, but also to the added muscle mass to both my upper back, arms, legs, and hips. //www.instagram.com/embed.jsThe throw above was a 5 foot PR at 61 feet from my best throw last year. That’s kind of a big deal. I hope to have a great performance next weekend, but after that my focus is going to be on training for a figure competition with the goal to cut weight and get to a shape that not only looks athletic, but looks good on stage in a bikini and heels. It will be hard, but I know I am up to the challenge and I know I will not only feel better, I’ll get into some better habits for maintaining my weight as well as my overall joint health. Slow and steady wins the race and so far so good. I’m looking forward to what’s ahead and here’s looking to the next step.